It’s dancing robots time in Kindergarten through 2nd Grade. Students will be programming Bee-Bots and Robot Mice to dance! First we will be reading the book Bug Dance by Stuart J. Murphy and then the students will be doing the Bug Dance and teaching their robots how to do it as well. Once the Bug Dance is mastered, students will program custom dances into their robots, as well. Grades 3 through 5 will be starting off with some unplugged dancing to review the concepts of Events and Loops. Then they will move on to programming a Dance Party in Scratch. There will be music and dancing and maybe even some webcam magic happening and all of the final projects will be shared on the students’ ePortfolios. St. Martin’s Middle Schoolers will be coding a Dance Party on Code.org! This new option for CSEdWeek looks to be lots of fun and I can’t wait to see what the students will create. Again, all of the final projects will be shared on the students’ ePortfolios. What are you doing for Computer Science Education Week? There was quite a bit of buzz this year on social media about doing activities around the Macy’s Thanksgiving Parade. At St. Martin’s Kindergarten, 3rd Grade, and 5th Grade joined this bandwagon. All three grade levels, learned a little about the history of the parade by listening to the book Balloons Over Broadway by Melissa Sweet. Students then created their own version of a parade balloon using Tux Paint (in Kindergarten and 3rd Grade) or Pinta (in 5th Grade). When they were done, Mrs. Sedgwick removed the background from the Tux Paint images and then created a showcase of the balloons in Google Slides. Next year, we’re thinking about doing a Thanksgiving robot parade with real balloons! 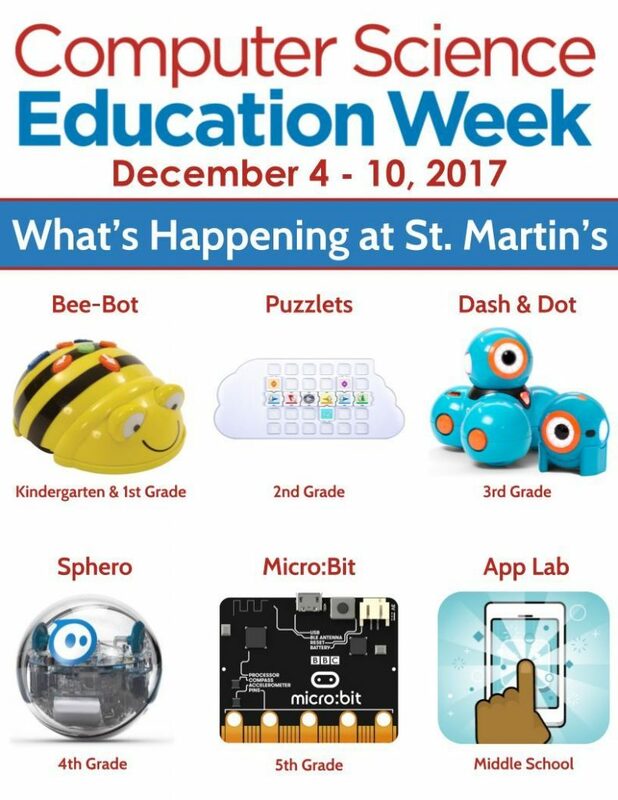 Computer Science Education Week kicks off tomorrow, December 4th, and we’re excited to be doing an Hour of Code (or more) with all Kindergarten-8th Grade students. Here’s what will be happening this week in St. Martin’s Computer Lab! So what do you do when you teach in a computer lab and rely on having electricity and access to the Internet and the power’s out? That was the case today at school. So were the computer classes canceled for the day? Absolutely NOT! 1st Grade uses iPads this year and though what had been planned for the day needed the Internet, Plan B was quickly put into place. After a quick discussion about the life cycle of a pumpkin, 1st grade got to work drawing pictures of each of the 6 parts of the life cycle. Next class, they’ll finish those up and then create short animations or maybe animated GIFs to show off the pumpkin life cycle. Anyone know of a good app for creating animated GIFs for 1st graders? Both 2nd and 8th grades were given a small Ziploc with 5-6 Lego pieces. They were told to build something with them (while not showing it to others) and then to write an algorithm that they could give to someone else to rebuild the same thing. This is based on this Activity Guide from Code.org. 2nd grade got through the building and mostly through the writing process. They will try the rebuild during their next class. The good thing about this for 2nd grade is that they participate in the Monster Project every year and that also has them create something and then describe it so someone else can recreate it. 8th grade completed this activity with a few “almost” successful algorithms but mostly non-successful ones. It’s tough to be that detailed even for 8th graders! The power came back on before 7th grade came into the lab so they did their regularly scheduled lesson (using EasyBib to create a bibliography for their DAR Essay). They were very disappointed that they didn’t get to play with Legos but that will happen later in the year for them! Mrs. Sedgwick has decided that she needs to have more “unplugged” activities ready to go just in case! We’ve been back to school for a week and a half now and classes are getting busy in the lab. Here’s what’s been happening so far! Both Kindergarten and 1st Grade will be using iPads for most of the year rather than the desktop computers. 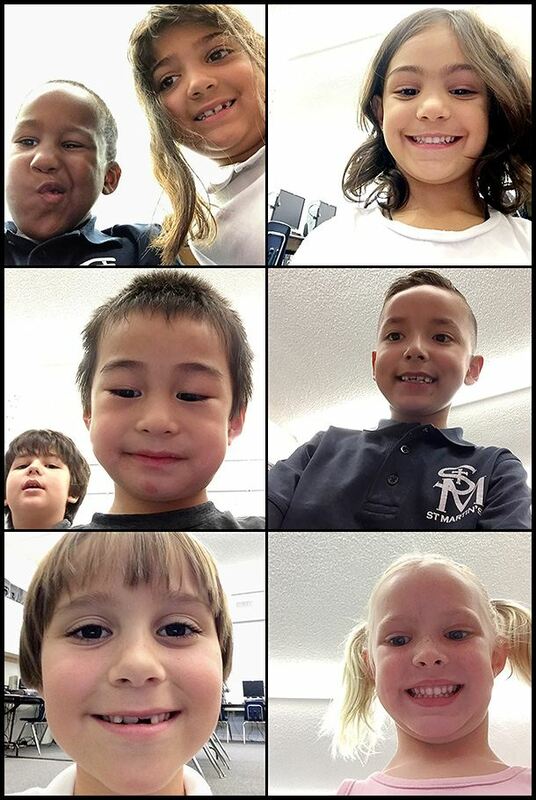 Kindergarten & 1st grade started the year with an introduction to the iPads including the names for the parts of the iPad and have taken selfies and a few other pictures. They will be definitely getting more practice with the camera as the year goes on. Kindergarten & 1st Grade also participated in International Dot Day which is a celebration of creativity centered around the book The Dot by Peter H. Reynolds. This year over 10 million people world-wide were part of the celebration! 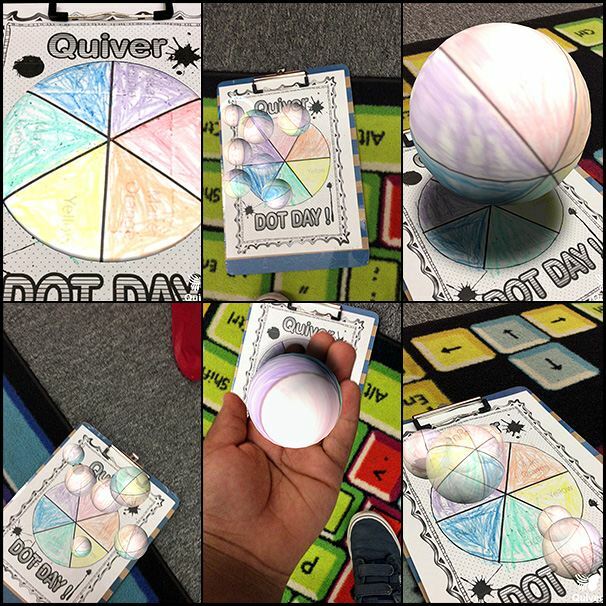 Both classes heard the story, The Dot, and then created color wheel dots, inspired by Tricia Fugelstad, an amazing art teacher from Illinois. The best part was seeing their dots come to life using the Quiver app on the iPads. I love hearing the “gasps” when it first happens! 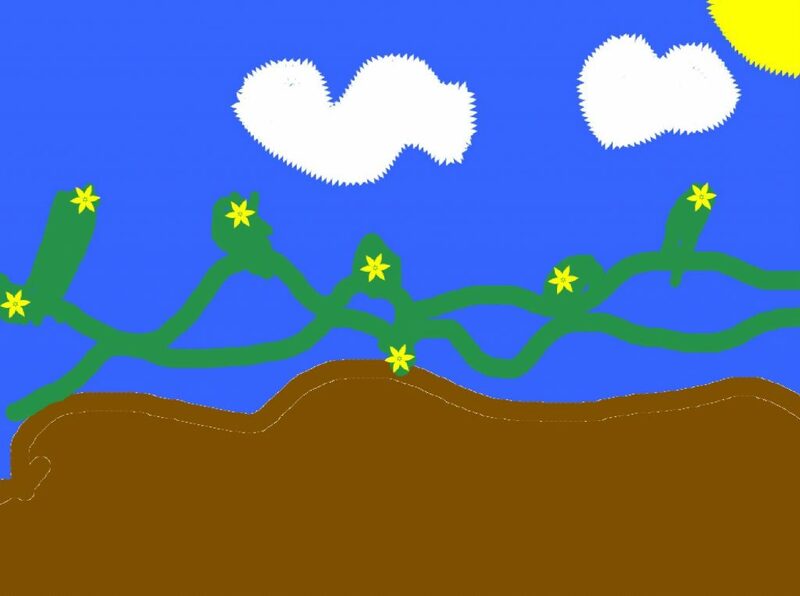 Kindergarten and 1st grade have also started drawing their self-portraits using the Tux Paint app. We will use a variety of drawing apps this year to try to figure out which one we like best. After an introductory review of the Computer Lab Rules, our 2nd & 3rd graders have been drawing their self-portraits. This is something that we do every year from Kindergarten-3rd grade and it is always fun to see how these evolve over the years. 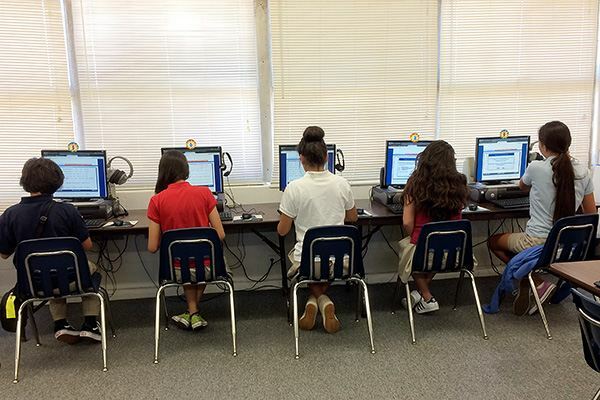 Our upper elementary and middle school students always start off the year with a series of keyboarding speed tests to see how well they are currently typing. They retake these same tests every quarter and create graphs of their growth at the end of the year. This isn’t only a keyboarding activity but a chance to work with some data in Google Spreadsheets as well. Every year the passwords on student accounts are reset. 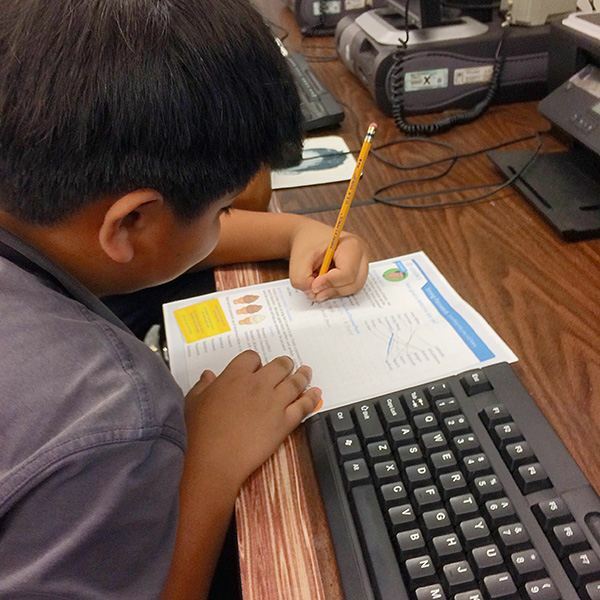 This year rather then just generating random passwords for all of the students, all students in grades 4-8 are participating in lessons on how to create strong passwords. Students will be generating their own password for the year based on some specific recommendations. Coming up in the lab, all students in grades K-5 will be participating in the O.R.E.O. Project – yes cookies will be involved and Google Spreadsheets, too! Did you see? Our 3rd graders finished setting up their Google Sites for the year and adding their first post about drawing their self-portrait. Check out their sites so far! 5th grade is currently working on getting their Google Sites set up. We have two that are live so far. More will be coming soon! 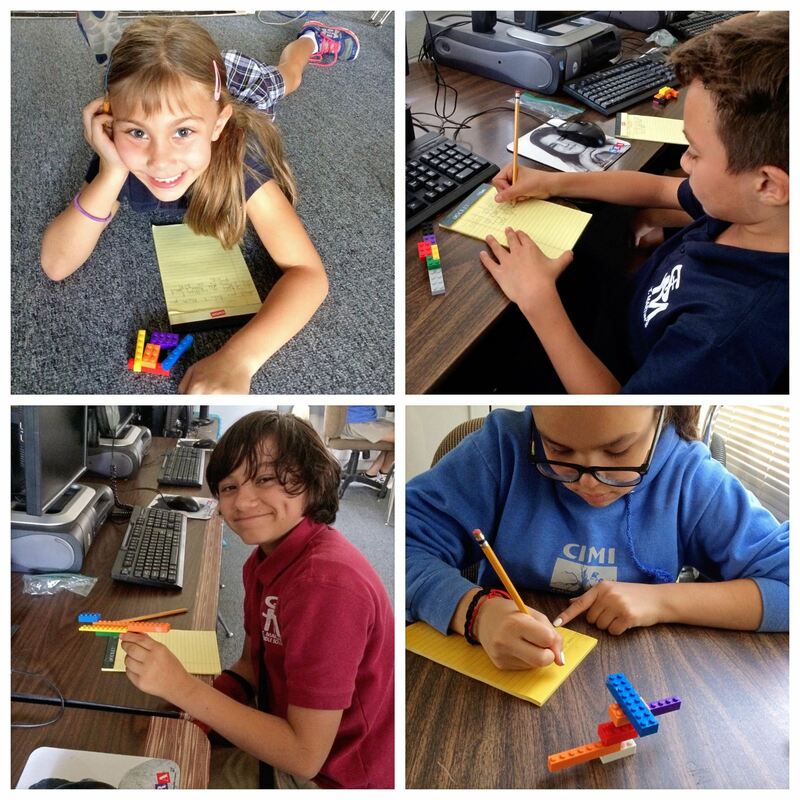 2nd grade has been busy adding the work they have completed to the 2nd Grade Seesaw Blog and Kindergarten also has some completed work on the Kindergarten Seesaw Blog. 1st grade will be wrapping up a project soon and sharing it as well. 4th grade and Middle School are busy with beginning of the year assignments but will be creating or updating their ePortfolio sites soon! Keep checking back on our Student ePortfolios page. How Fast Can YOU Type the Alphabet? 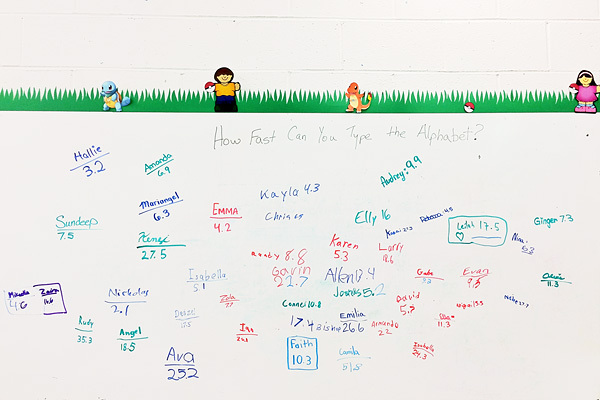 During some start up activities in the lab, all students in grades 3-8 tried to see how fast they could type the alphabet using Alpha Quick. Can you spot the fastest typist at St. Martin’s? No, your eyes are not deceiving you – Nicholas can type the alphabet in 2.1 seconds. Can you beat that? Most of the grades are focusing on Computer Science during the 3rd quarter. 1st Grade has started using ScratchJr and they spent some time this week coding valentines. You’ll see the created valentine and then a screenshot of the code that was used to create it.